Species of Heteroteuthis are the most oceanic members of the subfamily. They are capable of producing brilliant luminescence from their bacterial photophore or secreting luminescent clouds, in a variety of forms, from it. Their large visceral photophore is seen in the left photograph below with the mantle cut open; a closer view is seen to the immediate right. The two large pores on the photophore surface enable the luminescent material to be extruded from the underlying glands. The heavy covering of iridophores that provide the variety of colors seen in the photographs appear to act as a color filter and shutter for the bioluminescence. Other members of the subfamily presumably have similar luminescent capabilities but they have not been observed. Figure. 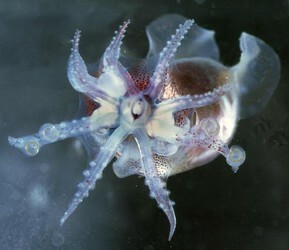 Left - Ventral view of H. hawaiiensis with the ventral mantle removed, female, Hawaiian waters. Middle - Close-up view of the same photophore. Left - See-through side view of H. hawaiiensis showing relationship between the ink sac, which surrounds the back of the photophore, the photophore and the ventral mantle shield which may act as a diffuser of the bioluminescence. Photographs by R. Young; drawing modified from Young (1977). ventral mantle shield confined to anterior half of mantle. fins attached posteriorly on mantle. Figure. Oral view of a living, mature male H. hawaiiensis holding onto the glass wall of an aquarium. The beaks are spread as the animal attempts to bite the glass. Photograph by R. Young. Some arms in females with bare tips. Figure. Oral view of arms I-III of a mature female H. dagamensis showing bare tips of arms I and II . Drawing by A. Hart. Funnel locking-apparatus with deep, curved groove or groove with deep, angled, posterior pit. Dorsal mantle free from head; nuchal cartilage free or fused. Fin length much less than mantle length. Fins attach on posterior half of mantle. Three named species are presently recognized in the genus, H. dispar (type species, type locality - Mediterranean Sea), H. hawaiiensis (type locality - off the Hawaiian Islands), and H. dagamensis (type locality- off South Africa). H. dispar and H. hawaiiensis are very similar but specimens have never been directly compared. As a result, reliable characters to separate them are unknown. An unnamed species, Heteroteuthis sp. A, is very different from the other species but is known only from a female. Figure. 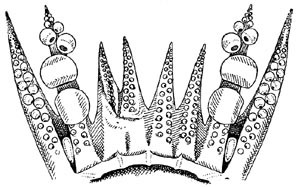 Left - Oral view of the arm crown of H. dispar, Mediterranean Sea, male. The third arms each bear two greatly enlarged suckers which are aligned in the drawing but actually one member is in the dorsal series and the other in the ventral series. Drawing from Naef (1921-23). Right - Oral view of the arms of a mature male Heteroteuthis dagamensis. Note that the greatly enlarged suckers are in the dorsal series and clearly alternate with smaller suckers in the ventral series. Drawing by A. Hart. Figure. Frontal views of the funnel locking-apparatuses; left of each image in anterior. Left - H. dispar, North Atlantic, left lock. Photogaph by M. Vecchione. 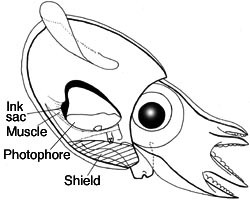 Right - Heteroteuthis sp. A, New Caledonia, right lock. Photograph by R. Young. Circumglobal in tropical to warm temperate oceans. 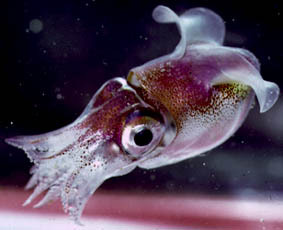 During the day in Hawaiian waters, H. hawaiiensis less than 17; mm ML were taken mostly between depths of 250 and 350 m; squid larger than 17 mm ML were taken at greater depths of 375-650. During the night squid less than 17 mm ML were mostly taken between depths of 150 and 200 m; larger squid were taken between depths of 110 and 550 m. Males and females mature around 15-16 mm ML. In Hawaiian waters the Mesopelagic Zone begins at about 400 m during the day (Young, 1983). Figure. Chart of the vertical distribution of H. hawaiiensis from Hawaiian waters, taken with both opening/closing and open trawls. Large blue dots - Night captures. Large yellow dots - Day captures. Small dots - Presumed contaminents from deep open tows. Dots represent the modal depth of the trawl regardless of trawl type. Bars with dots - Trawl fishing-range of open/closing trawls. Chart modified from Young (1977). As far as is known, sepiolids lay	their	eggs	on	the	ocean floor. Species of Heteroteuthis are the most oceanic members of the family. Nevertheless, evidence suggests that they also spawn on the ocean floor at moderate depths. Nesis (1993) found them, although broadly distributed in the open ocean, more common near seamounts and submarine ridges. Boletzky (1978) described an embryo of H. dispar that had been collected in an open bottom trawl (Mediterranean Sea, 540 m depth) and presumably had been collected on the ocean floor. 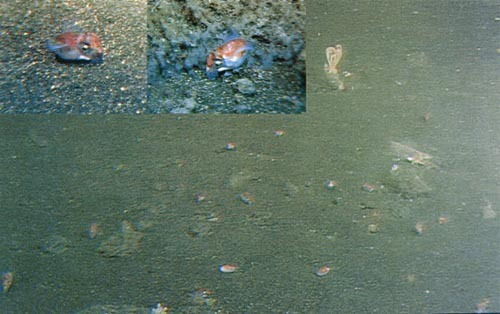 Okutani and Tsuchida (2005) reported numerous mature females of H. hawaiiensis on the ocean floor at a depth of 912 m near the Ogasawara Islands. Figure. Video images of H. hawaiiensis on the ocean floor taken by the ROV Hyper-Dolphin operated from the R/V NATSUSHIMA of the Japan Agency for Marine-Earth Science and Technology (JAMSTEC) on the gentle slope of Kaikata Seamount (26°41.25'N, 141°02.72'E) at a depth of 912 m (Okutani and Tsuchida, 2005). Inserts on the upper left show two individuals swimming near the bottom. The larger image shows more than a dozen individuals swimming near the bottom. Nesis, K. N. 1993. Cephalopods of seamounts and submarine ridges. In: T. Okutani, R. K. O'Dor and T. Kubodera (eds.). 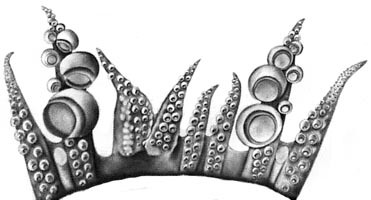 The Recent Advances in Cephalopod Fishery Biology. Tokai University Press. Tokyo, pp. 365-373. Okutani, T. and S. Tsuchida. 2005. Occurrence and living habit of bathyal bobtail squid, Heteroteuthis hawaiiensis (Cephalopoda: Sepiolidae) from off the dOgasawara Islands, Japan. 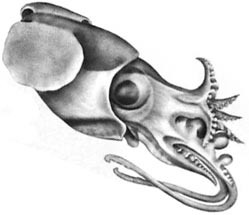 BOLETZKY, S. v. 1978 -- Premières données sur le développement embryonnaire du Sépiolide pelagique Heteroteuthis (Mollusca, Cephalopoda). Haliotis, 9: 81-84. Young, R.E. 1977. Bioluminescent countershading in midwater cephalopods. Proc. Zool. Soc. Lond., No. 38:161-190. Page: Tree of Life Heteroteuthis Gray, 1849. Authored by Richard E. Young, Clyde F. E. Roper, and Katharina M. Mangold (1922-2003). The TEXT of this page is licensed under the Creative Commons Attribution-NonCommercial License - Version 3.0. Note that images and other media featured on this page are each governed by their own license, and they may or may not be available for reuse. Click on an image or a media link to access the media data window, which provides the relevant licensing information. For the general terms and conditions of ToL material reuse and redistribution, please see the Tree of Life Copyright Policies.